Most countries have had one, the USA, France, Russia, China the list is endless, the Ukraine is currently having another one but the Brits look on and say ‘ it could never happen here ‘. When observing the national characteristics the idea of an English revolution seems to be a contradiction in terms, but the truth is we were the first, we had ours in the middle of the 17th century. Revolution is normally caused by Pluto or Uranus or in exceptional circumstances both. To cause a revolution in boring, staid olde England an unbelievable alignment of Pluto, Neptune, Uranus and Saturn was needed. Charles I was the English king at the time, succeeding to the throne in 1625. England had been a Protestant country for almost a century since Henry VIII’s divorce , but when his daughter Elizabeth died childless in 1603, the crown reverted to another line of the family and was taken by the Catholic King of Scotland James I. Charles was James’ son. Whilst James I had managed to tread a precarious religious tightrope fairly comfortably without antagonising either side too much, Charles was a different character. After his succession, Charles quarrelled with the Parliament of England, which sought to curb his royal prerogative. Charles believed in the divine right of kings and thought he could govern according to his own conscience. Many of his subjects opposed his policies, in particular the levying of taxes without parliamentary consent, and perceived his actions as those of a tyrannical absolute monarch. His religious policies, coupled with his marriage to a Roman Catholic, generated the antipathy and mistrust of reformed groups such as the Puritans and Calvinists, who thought his views too Catholic. 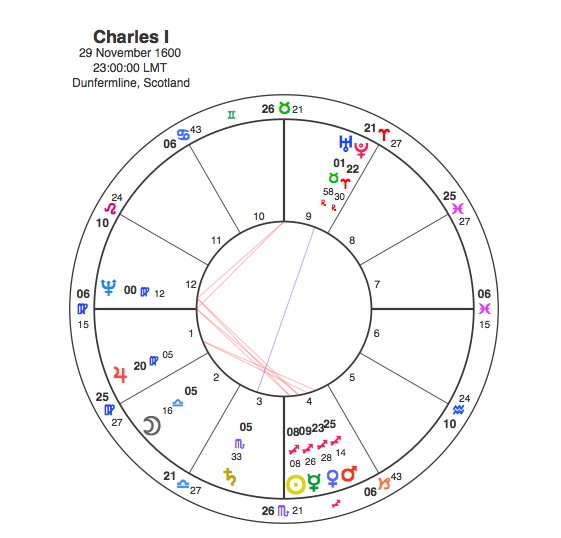 What kind of chart might we expect for Charles ? The idea of rule by divine right is very Leonine but the Jupiter ruled Sagittarius is also a sign that believes in its own innate superiority. Capricorn Research has demonstrated that many Catholic charts throughout history have a strong Virgoan emphasis, due in part to the particular veneration of the Virgin Mary in that religion. Charles has the Sun, Mercury, Venus and Mars in Sagittarius. His Sun and Mercury are square to a Virgo Ascendant which is conjunct the spiritual Neptune. Immediately the main themes are evident. Sagittarius is a sign that believes in outspoken directness about its own views, its not the sign of someone looking for a diplomatic way out of its difficulties. It tends to have the view ” its my way or the highway “, in fact given its tendency to travel it could be my way and the highway. Someone with the Sun and Mars in Sagittarius would be quite assertive about their own view of the world and if others didn’t like it that would be their problem. The Sun in Sagittarius square to Neptune in Virgo would indicate an outspoken Catholic, someone who would be dogmatic and not easily accept the views of others. Charles has Mars square Jupiter an aspect that tends towards extravagance and doing things in a grand ostentatious and direct style. That Mars is in Sagittarius in square to Jupiter in Virgo reinforces the theme of his divine right to rule and to impose his religious belief on his subjects. The only other aspect in his chart is an interesting one, an opposition between a Uranus / Pluto conjunction ( which would only occur once in a century ) and Saturn. This is the indication of the coming revolution. Uranus and Pluto are the planets of sudden even drastic change, Uranus for political reformist reasons and Pluto just for the hell of it. Saturn is the planet of authority and convention. This opposition is clearly indicating political upheaval and a serious challenge to the powers that be. Charles succeeded to the throne in 1625 when Saturn was conjunct his Ascendant and square his Sun which is definitely not a good sign. A chart drawn for the succession of a monarch will identify the themes of his or her reign. No time is available but a noon chart is very revealing. There is a very close T Square based on an opposition between the Moon in Scorpio and a Venus / Pluto conjunction which focuses onto an apex Uranus. There is another wider focus onto an apex Saturn. This is as clear as it gets in terms of pointing towards revolution. Scorpio is a sign of great transformation and upheaval so the Moon there opposite Pluto signifies a total destruction of everything in order for a radical new start to occur. That this focuses onto Uranus points to a new world order and onto Saturn to the downfall of traditional authority. The fact that both Saturn and Uranus are in the royal sign Leo means the king has to be killed in order to make the new start. The assassination of a king might not cause too much of a stir these days but in the 17th century that would be the most momentous and frightening thing imaginable. Monarchy meant absolute power which was given by birth from God and to defy it would be like going against the whole Universe. As soon as he ascended to the throne, Charles set about upsetting the Protestants. In May 1625 Charles married the fifteen-year-old Catholic French princess Henrietta Maria. Charles delayed the opening of his first Parliament until after the wedding ceremony, to forestall any opposition. Many members of the Commons were opposed to the king’s marriage to a Roman Catholic, fearing that Charles would lift restrictions on Catholic recusants and undermine the official establishment of the reformed Church of England. Although he told Parliament that he would not relax religious restrictions, he promised to do exactly that in a secret marriage treaty with Louis XIII of France. Moreover, the treaty placed under French command an English naval force that would be used to suppress the Protestant Huguenots at La Rochelle. Charles was crowned on 2 February 1626 at Westminster Abbey, but without his wife at his side because she refused to participate in a Protestant religious ceremony. So a fairly Sun Mars in Sagittarius square Neptune / Ascendant in Virgo start to his reign then. Things escalated from there. In those days Parliaments were called by the monarch mainly to raise funds for their own military adventures. In November 1940, Charles called the Long Parliament in view of his failed expeditions to Scotland and Ireland. As soon as it was called Parliament began proceedings to impeach the king’s leading counsellors for high treason and to prevent the king from dissolving it at will, the Triennial Act was passed which required Parliament to be summoned at least once every three years, and permitted the Lord Keeper of the Great Seal and 12 peers to summon Parliament if the king failed to do so. This Act was coupled with a subsidy bill, and so to secure the latter, Charles grudgingly granted royal assent in February 1641. In November 1641, Parliament distrusted Charles’s motivations when he called for funds to put down the Irish rebellion, many members suspected that forces raised by Charles might later be used against Parliament itself. There were rumours that Parliament intended to impeach Charles’ wife for conspiring with the Irish rebels, and Charles’ response was to enter Parliament to try and arrest 5 of the ringleaders. This failed as they had escaped in time but no English sovereign had ever entered the House of Commons, and Charles’ unprecedented invasion of the chamber to arrest its members was considered a grave breach of parliamentary privilege.In one stroke Charles destroyed his supporters’ efforts to portray him as a defence against innovation and disorder. The English Civil War between the Royalist Cavalliers and the Parliamentarian Roundheads began in mid 1642. The Civil War lasted for over 6 years and inevitably there was much toing and froing. In the early stages Charles gained some significant victories but as things progressed the Roundheads became stronger and eventually won. Capricorn Research is inclined to put the victory down to two men, William Lilly and Oliver Cromwell. Cromwell you might have heard of, but Lilly probably not. William Lilly was without question the finest English astrologer of all time with a predictive success rate that was and still is astounding. He predicted the Great Fire of London in 1666, 18 years in advance with a foresight so incredible that he was brought before a Parliamentary committee who suspected that he started it purely to enhance his reputation. Lilly’s politics were with Parliament but he also had some sympathy with the King. He predicted the critical Roundhead victories at Naseby in 1645 and Colchester in 1648. Lilly was a practical Taurus with the Moon in pragmatic Capricorn and like any sensible fellow in a civil war was happy to give astrological advice to both sides. He secretly gave advice to Charles on how to escape from a difficult position but in true Sagittarian fashion, Charles ignored this wisdom so he only had himself to blame. Most historians believe the Roundhead victory had more to do with Oliver Cromwell who rose from having no military experience to becoming Lieutenant General by the time of the Battle of Marston Moor in 1644 and the success of his cavalry in breaking the Royalist ranks and then attacking their infantry from the rear was a major factor in the victory. Cromwell introduced close-order cavalry formations, an innovation in England at the time, he kept his troops close together following skirmishes where they had gained superiority, rather than allowing them to chase opponents off the battlefield. This facilitated further engagements in short order, which allowed greater intensity and quick reaction to battle developments. This style of command was decisive at both Marston Moor and Naseby. Cromwell was not an intellectual, he was a practical man as evidenced by his Sun / Moon conjunction in Taurus. As military leaders go you could not ask for much more than that with 4 planets in the battling Aries. Mars in Aries in the 1st house is the simplest symbol of the soldier. Cromwell was born the year before Charles and also had the Uranus / Pluto conjunction but his Mercury was placed in between them. This was a sign that identified him with the revolutionary forces but also gave him tremendously innovative skills as a military strategist. Cromwell’s Arien Mars and Pluto were opposite Saturn and the forces of reaction. In Charles’ chart this opposition existed on its own. In Cromwell’s chart it focused by T Square onto an apex Jupiter, a clear indication that he would be the victor in the civil war. 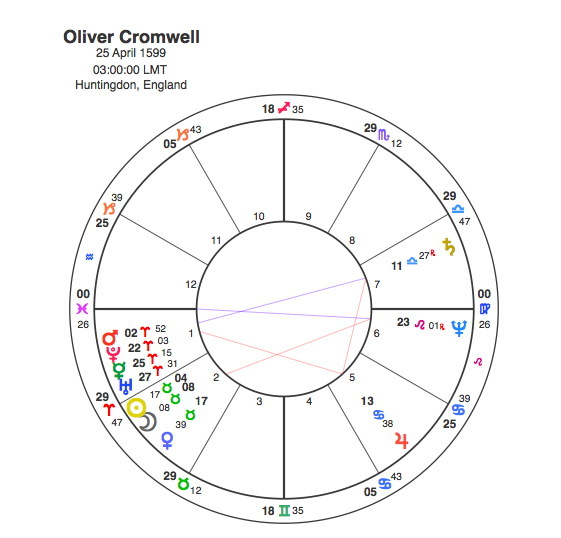 The synastry between Charles and Cromwell’s charts is interesting. The thing that signifies the civil war and his eventual demise in Charles’ chart is his Saturn / Uranus opposition. This aspect falls bang on Cromwell’s Sun and Moon. In a neat mirror reflection the thing that signifies the civil war and his victory in Cromwell’s chart is his Mars / Pluto / Saturn / Jupiter T Square. This aspect falls on Charles’ Moon. Oliver Cromwell was not committed to radical politics. His faith convinced him that God had spoken against both the King and Parliament as lawful authorities. For Cromwell, the army was now God’s chosen instrument. Cromwell firmly believed in “Providentialism”, that God was actively directing the affairs of the world, through the actions of “chosen people”. Cromwell believed, during the Civil Wars, that he was one of these people, and he interpreted victories as indications of God’s approval of his actions, and defeats as signs that God was pointing him in another direction. As any self respecting Sun / Moon Taurean pragmatist would. Cromwell did believe that the only way to end the civil war was to execute the King and together with 59 of the High Court’s members signed the death warrant. In the most radical development in the whole of English history, Charles was executed at 2:00 PM on 30th January 1649. That this was a momentous event in history is clearly recognised by the chart. Of course regular readers of these pages would expect Pluto to be prominent and it did not disappoint being at 8 degrees Gemini, exactly opposite Charles’ Sun. The staggering thing is that Neptune and Uranus were conjunct Charles Sun and Saturn was opposed it. This is a heavyweight astrological pattern that has probably never occurred before or since in the history of mankind. Not only that but this mega opposition was part of a cataclysmic Grand Cross which included the Moon and Mars and Venus. 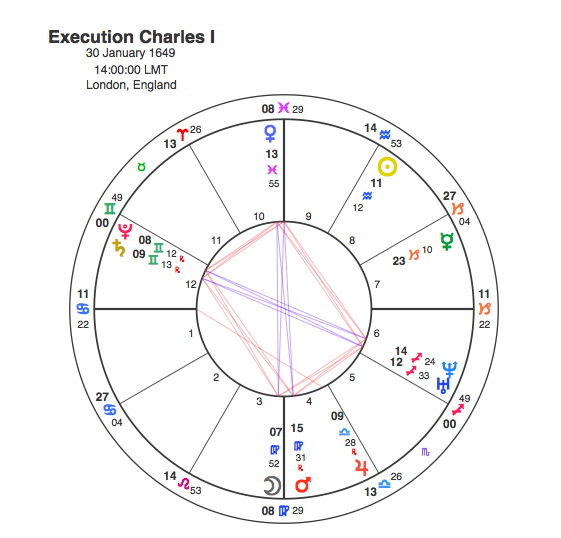 The Moon in the execution chart is exactly conjunct Charles’ Ascendant and square his Sun. In order to change history in such an unprecedented way and to overturn the supposed will of God and divine right of Kings, it seemed that the Universe needed agreement from all the slow moving heavyweight planets and arranged for them to slug it out together on that fateful day in 1649. So the English can do revolution they just need a much bigger astrological shove than any other country. This kind of clever work and reporting! Keep up the superb works guys I’ve incorporated you guys to blogroll.